LEGO has officially revealed three building sets inspired by the highly-anticipated sequel Spider-Man: Far From Home, arriving in theaters on July 5. The three sets will be available at select retailers on April 22, and you can learn more about the new products below as well as view new photos in the gallery! 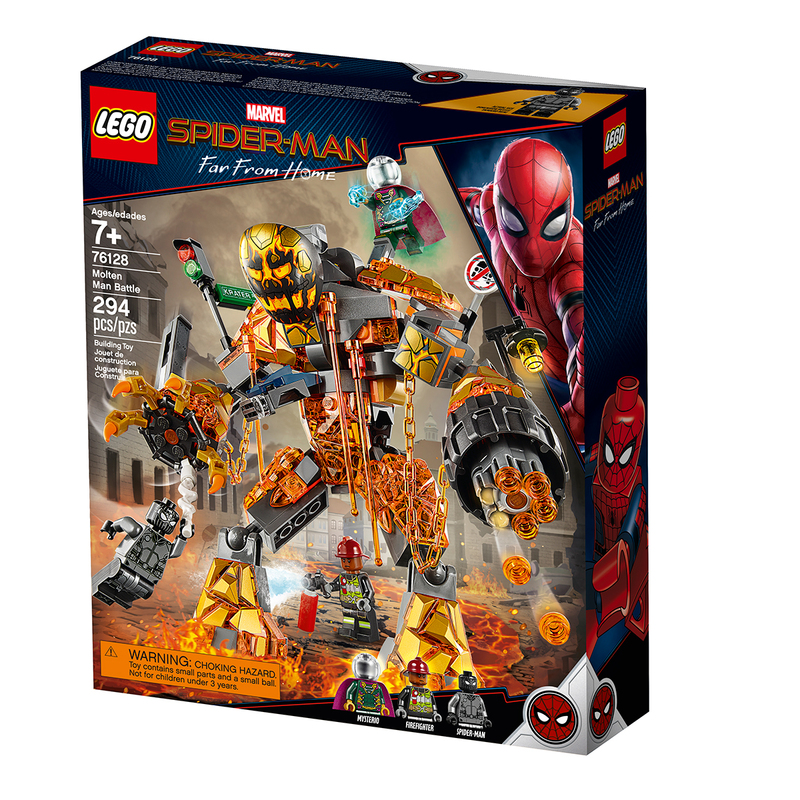 Molten Man Battle ($29.99, 294 pieces): Join Spider-Man and Mysterio in the heat of battle to stop Molten Man from melting down the whole city! -This Spider-Man toy building set includes three Marvel Universe mini-figures: Spider-Man, Mysterio and a firefighter. -Molten Man buildable figure features a posable head, arms and legs, gripping claw, 6-stud rapid shooter, buildable ‘melting’ objects including half a car, street lamp, traffic light, chain, melting lava stick elements and various attachment points for mini-figures. -This Spider-Man playset features mini-figure weapons including Spider-Man’s web pack and Mysterio’s power energy elements. -Accessories include the firefighter’s buildable fire extinguisher for creative play. -The Marvel Spider-Man mini-figure features new-for-May-2019 black and grey stealth suit decoration and the Mysterio mini-figure is also new for May 2019. -Recreate thrilling scenes from the Spider-Man: Far From Home movie with this creative building toy. -Add 76129 Hydro-Man Attack and 76130 Stark Jet and The Drone Attack construction toys for even more Spider-Man action. Hydro-Man Attack ($39.99, 471 pieces): Take a romantic trip to Venice with Peter Parker and MJ before Hydro-Man crashes the party. -This Spider-Man playset includes four Marvel Universe mini-figures: MJ, Peter Parker, Mysterio, and Hydro-Man, plus a LEGO rat figure. -This LEGO Marvel Spider-Man construction toy features a Venice scene with a canal-side café, bridge, gondola and a buildable water base for Hydro-Man. -Café features a tower with attachment points for mini-figures and web elements, rooftop garden with plant elements, buildable coffee machine and outside space. -Outside space features an explode function, buildable table, coffee cup, pizza slice and newspaper elements, 2 mini-figure seats, buildable street lamp, and flower elements. 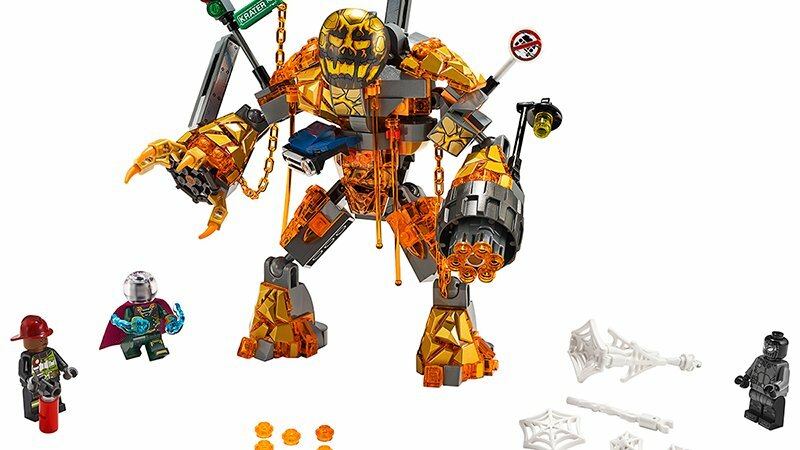 -Bridge features an explode function, attachment points for mini-figures and web elements, sewer with LEGO rat figure, pizza slice element and a gem element. -The gondola has two mini-figure seats and an oar element. -Activate the café and bridge explode functions to send mini-figures flying into the canal. -Take apart and build up Hydro-Man’s water base to elevate him to different heights. -This superhero playset includes Mysterio’s two power energy elements for imaginative play. -Accessory elements include Peter Parker’s interchangeable Spider-Man mini-figure head, plus nine assorted Spider-Man web elements to customize your builds, mini-figures and weapons. -Peter Parker, Mysterio, and Hydro-Man are new for May 2019. Stark Jet and the Drone Attack ($69.99, 504 pieces): Defend Venice against drone attacks with Happy Hogan, Nick Fury, Mysterio, Spider-Man, and the super Stark Jet! -This building set includes four Marvel Universe mini-figures: Happy Hogan, Nick Fury, Spider-Man and Mysterio. -Stark Jet features a dual mini-figure cockpit with pilot seats for Happy Hogan and Nick Fury, control panel stickers, two guns, plus a passenger seat for Spider-Man, opening hatch function with attachment point for Spider-Man’s spider web string element, rear storage compartment for 3 buildable energy bombs, adjustable wings and two stud shooters. -Press the button on the top of the jet to open the hatch and drop bombs or let Spider-Man swoop down from the jet on his spider web string. -Each buildable toy drone features two stud shooters. -Weapons include Happy Hogan’s gun, Nick Fury’s shooter and Mysterio’s power energy elements for creative play. -This Marvel building toy also includes the Spider-Man mini-figure’s spider web string element. -Nick Fury and Mysterio mini-figures are new for May 2019.